Your son is not the only one struggling. 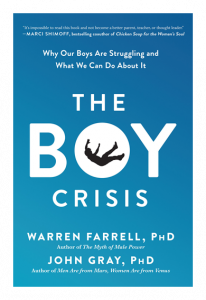 According to Dr. Warren Farrell — and a slew of research — boys in 63 of the largest developed nations are faring worse than girls. They’re doing worse academically. They’re falling behind in the workplace. And their physical and mental health is failing as well. 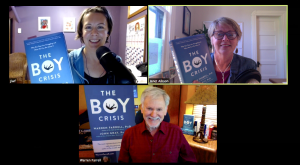 In his new book, The Boy Crisis: Why Our Boys Are Struggling and What We Can Do About It, Farrell (and his co-author, John Gray) examine the many factors contributing to the boy crisis. They also point toward possible solutions. Solving the boy crisis will take a lot of effort on the part of parents, teachers and politicians, but it’s a cause that’s well worth our attention, because when our boys suffer, society suffers. Coalition to Create a White House Council on Boys & Men — multi-partisan effort working to create, well, a White House Council on Boys & Men, to research and implement initiatives to support the well-being of males, in the same way the White House Council on Women & Girls has since its establishment in 2009. And, just for fun, watch the uncut version on Youtube!